Not on the agenda: URGENT letter to Jared Polis, urging him to add immigrant rights staff to his transition and permanent teams. The letter will be hand-delivered Monday. Please obtain your group’s ok, and sign the letter now. Please take a minute to fill out this survey! It will help me learn how best I can support your tireless work! Indivisible’s first national Day of Action is January 3rd. The theme is “Whose House? OUR HOUSE!” and the goal is to make a big public splash everywhere, letting anyone who thinks we might have dissipated after the election know that WE”RE STILL HERE. Here’s a Day of Action “Take your Rep Back to School” toolkit that might prompt some ideas. 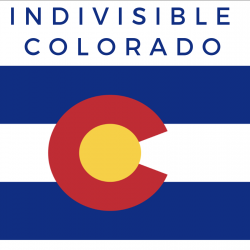 Indivisible Statewide November 29th Agenda–review for links. Meeting notes aren’t yet available, but most links in this agenda are to EXPLAINERS and EXAMPLES. Next calls: Dec 20, 6:00 pm to 7:00 pm; January 17th, 6:00-7:15 pm. Special guest Morgan Carroll. Other ideas? Letters to the Editor? Thank you, always. And have a safe and happy holiday season. You’ve earned it. I’ll be out of town the week of December 2nd.